I've posted about my craft space before when I first made some fabric buckets and organized my peg board (see more of that here). Things worked well for almost a year, mainly due to the fact that with school I wasn't able to utilize the space as much as I would have liked. 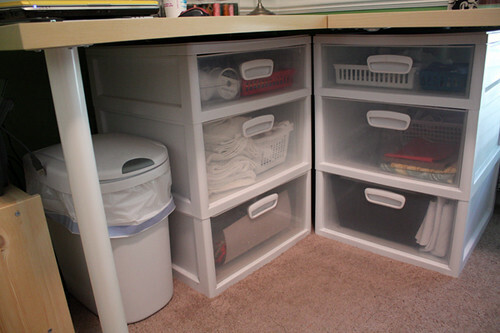 In this post I'm going to highlight the desk area of my craft/office space and in another post I'll show off my fabric storage. Lately I began to realize that my biggest problem was lack of desk space. I had room for my sewing machine and laptop but if both were out and in use then there wasn't much room for anything else. About a week ago I started looking at IKEA and found a corner desk (this one) that I thought would match up with my existing desk. I didn't want to waste money on an entirely new desk when I had a perfectly good one. I went to IKEA and realized 1) depth-wise it was too short and was not going to line up with my existing desk and 2) it was too big and wouldn't fit in my car. So I headed home and tried to find a solution. I came across IKEA hackers, in particular this post since it used the desk I already had. It also used a matching desk that was longer than the one I already owned (this one). Back to IKEA I went, along with a stop at Lowe's, to get my needed supplies. Of course I ended up with a few other things that made my OCD mind happy. I put the desks together. 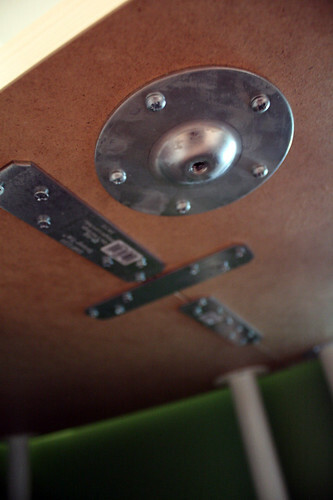 Then screwed in the plates from Lowe's to connect the two tables and allow the meeting point to be stable without the extra leg (the silver round piece is where that leg would screw into the table). The piece in the middle is the first one I screwed. As I was installing it, I realized that it wasn't solid wood through front and back. It wasn't stable enough, so I screwed the other 2 plates in perpendicular to the first for better support. The edges were solid and provided more support where the two tables meet. At IKEA I also picked up a shelf extender (2 of these with this) which has given me even more additional space. This addition to the table is not permanent and no holes had to be screwed into the desk for it to work. 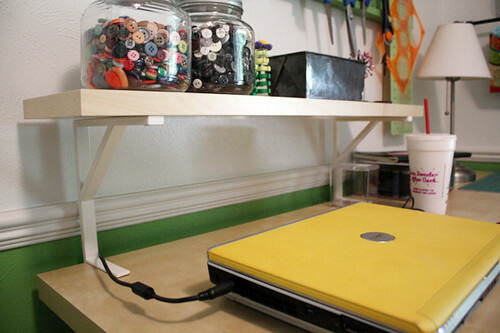 Here I can keep all of my buttons, bobbins, and pins close and store my laptop underneath and out of the way. 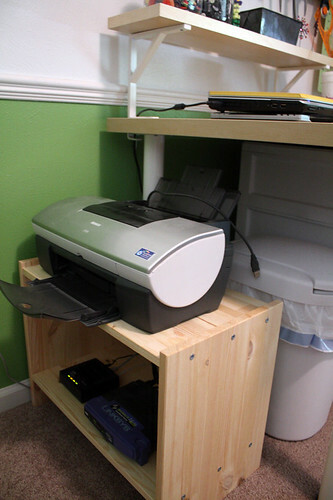 I wanted to keep the printer off my desk (it takes up way too much space and I don't use it all the time). I found this wooden night stand at IKEA which fits my printer perfectly and has an additional shelf for my DSL and wireless router. Perfect. Under the desk I have my trashcan handy along with some Rubbermaid drawers that I already had been using in another room prior to this rearrangement. It works really well here, I can have a lot of the things I use a lot within reach. It is also the perfect height to fit under the desk. Off to the side of the desk I have these cute three-tiered wire baskets that I picked up in Canton at the First Monday Trade Days. I keep small completed projects here. Last is my slightly revamped peg board. I just imagine all the wonderful things i could create in your space. Do you need a craft partner?? quite impressive!! you may need to come to my house and organize!! Looks like it's coming together nicely, Lori! 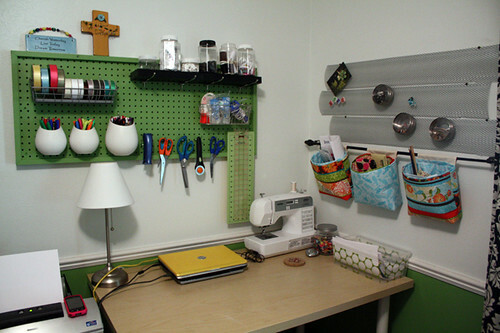 I've often been surprised that I don't see peg boards more widely used in sewing spaces. 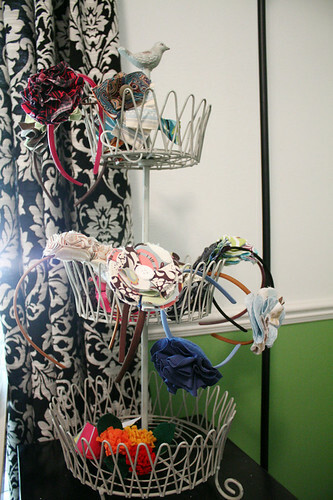 I've been using one for 6 or 7 years now and I couldn't stay organized without it! I found your post via Pinterest. I love your space! 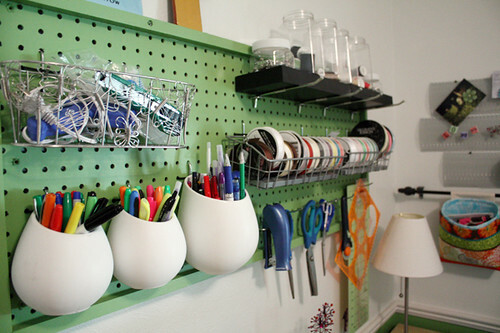 I have been thinking about getting a peg board but I don't know where to find a smaller one. Where did you get yours? Oh my gosh! 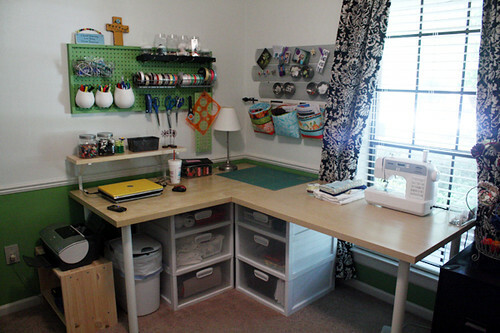 This is an awesome craftroom!